Simukai means ‘stand up’ in Shona the language spoken in Mutare the third largest city in Zimbabwe. Simukai is an organisation that ‘stands up’ for child rights. Over the summer I have spent my time working with street children through the International Citizen Service where me and my team worked to empower change within the community. We worked on many different projects such as Child Rights Awareness Campaigns, workshop sessions and infrastructural work. Some of the workshop sessions looked at developing knowledge on sexual health, HIV/AIDS, healthy relationships, career guidance, sustainable living, recycling, drug abuse, dream design, CV writing and many more. Many of the workshops we ran where requested by the children all of which living in difficult circumstances where an education was hard to come by. My group worked at the Simukai Education and Rehabilitation centre where we worked with the scouts, holiday club, after school club, ECDs (early child development) and Sakubva study club. What was special about working with these unique children was that they had a great appreciation of our time, one student in particular said “the lesson was fantastic and we and learnt things which we had never even learnt before, we want to learn more and become good and better people”. Some of these children had been at school all day and would come to the after school or holiday club to develop their knowledge even further. Many of the children would have extra responsibilities at home such as chores around the house the children would run the household with their mothers. This dedication shows how committed the children are to making something of themselves and if you talk to them they have big aspirations and goals many wanting to be teachers and doctors. I have a huge admiration for these children, their strength gives me courage. However the most influential period of my placement was cultural exchange. Which included our team of national and international volunteers being divided into two groups, each staying with a different family living in a rural part of Mutare. We stayed with the family for a weekend and endured rural life. Many of our duties included bringing water from the stream which was a 40 minute walk there and back, cooking for the family which including us was 16 and cleaning such as washing and sweeping. Seeing the struggle and dedication to everyday life really made me appreciate how easy living is in the UK and how much I had been taking for granted back at home. Even having electricity such a simple concept is unappreciated in England. While on culture exchange we watched the family slaughter and prepare livestock (goat and chicken) this was horrific! I cannot even put the event into words, however it showed how the family had to survive on a frequent basis. Zimbabwe will always have a major impact on my life and the decisions I make in the future. I met some great people and made many friends in Mutare all of which I miss dearly now I am back in the UK. As part of my teaching course we were to complete an experiential placement that involved working with children outside of the school environment. I thought that this would be a good opportunity to do something a bit different and perhaps travel to somewhere outside of the UK. The previous summer a friend and I had been on holiday to Salou in Spain. The hotel that we had stayed in had both daytime and night time children and adult entertainment and the people were who ran these were all friendly and bubbly and always seemed to be enjoying themselves. We got the idea to contact the company and ask whether it would be possible to volunteer for three weeks and help run the kids club that took place every day and night. We were surprised when we got a reply saying that they would be very interested in having us and were keen to find out more. The company provided us with our meals and our accommodation so the money that I received from the trust went towards the cost of the flights. The job required us to work each day at a hotel running the kids club, alongside members of the staff from the company. They already had a schedule of what activities would be done each day and what theme it would be. 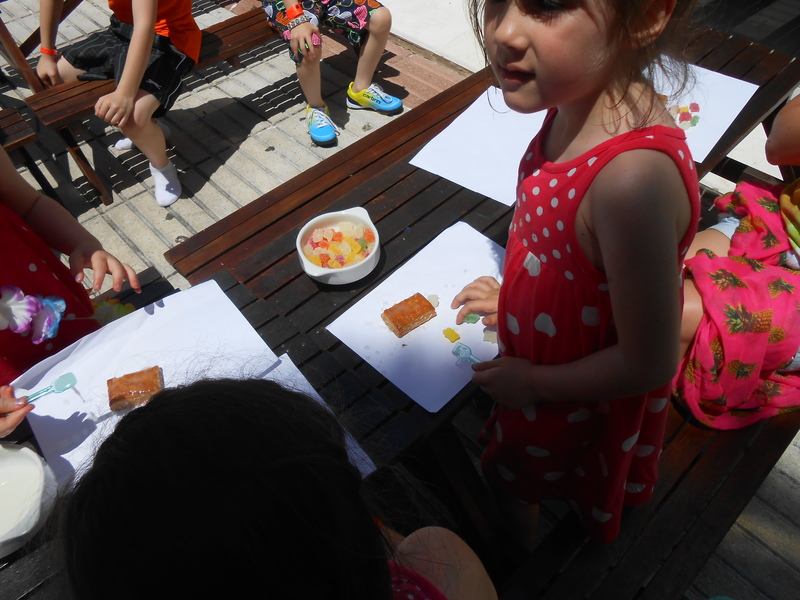 The activities that we mainly did were colouring, learning Spanish (with activity sheets etc), costume making, karaoke, biscuit decorating, games and many more. Most days had a particular theme, for example a Disney theme, and every activity would centre on that theme. The most enjoyable theme for me was a pirate day and one of the activities was creating boats and racing them on the pool. The children really enjoyed this activity, as it was the most hands on and allowed for a bit of friendly competition. The kids club also offered a “kids lunch” where if they wanted, the children could all go to lunch together and we would sit with them and supervise. The children enjoyed this, as they were able to sit with their friends that they had made in the kids club. The biggest challenge that I faced was taking part in the “kids fun time” part of an evening. This entailed us (the entertainers) to perform dances on stage for the children to copy and join in with. As I am quite a shy person and have never taken part anything like this before, the thought of even just standing on a stage in a hotel room full of people terrified me. However, after a few days of joining in with the children on the floor, I was asked to join the other two entertainers on the stage to help to model the routine. Surprisingly, I really enjoyed myself and would probably even go as far as to say that the kids’ fun time was my favourite part of each day! 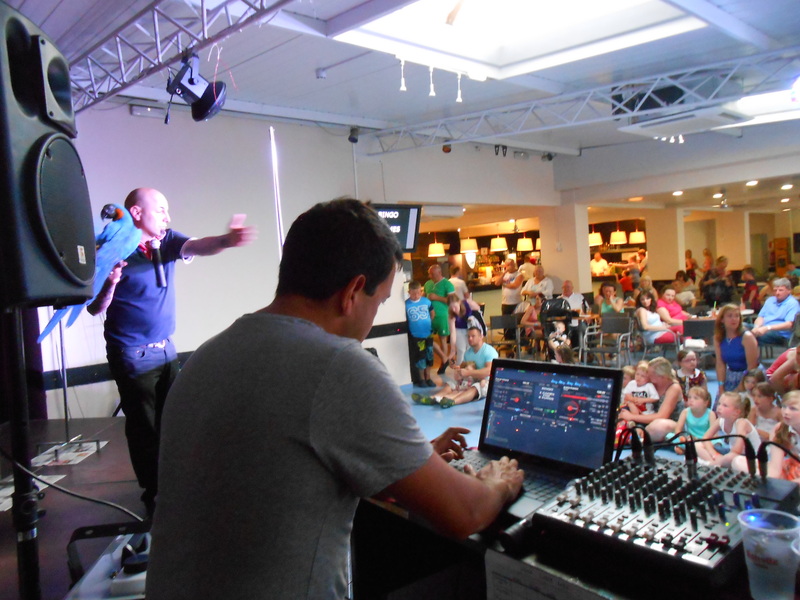 As well as being an entertainer in the hotel, I was asked to help run the kids club at one of the shows the company ran each Wednesday. The show was called “Decades” where different tribute acts performed ad different bands and singers from different decades from the 50s to current. There was a separate room for the children where they watched a Disney princess show, a magic show and then watched a film. I enjoyed taking part running this once a week as it gave me a change on environment and allowed me to carry out different roles to the ones in the hotel. Overall the biggest thing that I got out of the trip was pushing myself out of my comfort zone and helping me gain confidence to try new things. I met a lot of interesting and different people- both workers and guests which I wouldn’t have done otherwise. It was also beneficial as I was able to work and interact with children on a different level to what I am used to doing in a school. The company we worked for were very grateful for us volunteering as they gained help from two people who are both very experienced with children and were also valuable when their members of staff were needed to carry out other tasks. I am currently a student on the Primary Ba(Hons) 4 year Teaching Degree. The course required me to organise an experiential placement; an opportunity to gain experience in a completely new environment, separate from my placements on teaching practice. I wanted a chance to try and make a difference and I wanted to choose to spend my time doing something out of my comfort zone and an experience that was completely unique to previous placements. A volunteer organisation was recommended to me. 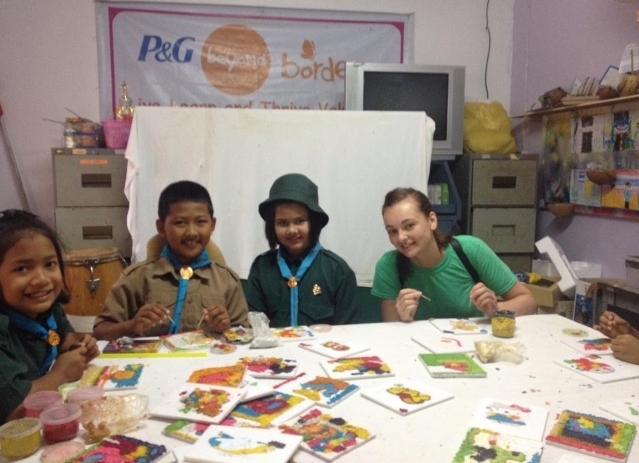 I did more research into why some schools in Thailand needed volunteers to go and teach them English and why the company, Original Volunteers, felt it was important enough to organise the voluntary support and send volunteers over. This information lead me to my decision; it was time to leap out of my comfort zone, travel half way around the world and offer my teaching skills to a deprived part of the country. I knew this would be a costly trip, so I applied for funding through the Eleanor Peel Trust to help me and I am very grateful that this application was successful. How Did I Benefit From this Experience? My time in Thailand has given me a deeper insight into the difference in education systems and this has been beneficial to me as I am studying on a teaching degree and have only had experience with the Primary National Curriculum in England. It has benefited me by allowing me to compare the extreme differences, such as lack of resources available in Thailand in comparison to the range of resources available in England. I have benefited by immersing myself into Teaching English as a Foreign Language (TEFL) which is an area I have not yet covered. I found the methods used for TEFL were very repetitive and visual which is a different teaching approach to methods I would normally use teaching in England. During the school week I was placed within a town called Khok Kloy. This enabled me to see the Thai culture from a different perspective, as a local. In comparison to my luxurious lifestyle in England this was challenging. I do however feel this was beneficial to my overall experience; I was able to gain a better insight into their lifestyle. It has definitely made me more aware of how lucky I am as a student to have access to so many opportunities, especially through a free education system where English tuition is completely free! How Did People I Worked With Benefit? Ken and Sunny were based in khao Lak and they organised all placements. They benefited by having me as a volunteer; I was hardworking, reliable and committed. This meant they received good feedback from school and they did not have to waste time chasing me up as I had completed my planning on the Thursday evening when I returned from school. Preparing the teaching packs were my priority, so I wanted to ensure I had these ready for school the following week and then had the weekend to myself. Ken and Sunny also benefited greatly due to the fact that the whole point of organising volunteers to travel to Thailand and train them is because they care enough about these poorer Thai children and their future. Therefore if people like myself did not volunteer their time to go and support this cause, Ken and Sunny would not be able to deliver all the English lessons themselves to all of the schools involved. This would mean that the quantity of children receiving extra support would be significantly low. The school I was placed in was called Ban Paa Yang. It was a poor area of Thailand where the families could not afford to send them to a school with an English speaking teacher. The national exams which allow students to access higher education in Thailand are in English. consequently without adequate English teaching, students from these poorer schools will never be able to achieve their dreams of a better future. This would mean that the cycle will reoccur where they will be in an unfortunate situation like their parents, earning as little as £1 per day and being unable to afford good English for their children, giving no hope to their future. Therefore the children benefited greatly by having support from the volunteer organisation to receive free English tuition which will help towards a better future. The school staff also benefited due to having a fluent English speaker in for a significant number of weeks. On occasions the staff would be present in the lessons so that they could try to learn some of the English. The Thai teachers were not taught English so it was vital that they involved themselves as much as possible when they were able to so that they could increase their knowledge and vocabulary along with their students. Experiencing the Thai culture on the weekends as a tourist and as a local during the week was a unique experience. I was based in Khao Lak on the weekends where there were a choice of restaurants and activities. This was great as I have never been to Thailand before so this gave me opportunity to do activities that they offer to tourists such as visiting the temples, waterfalls and Elephant Trekking. 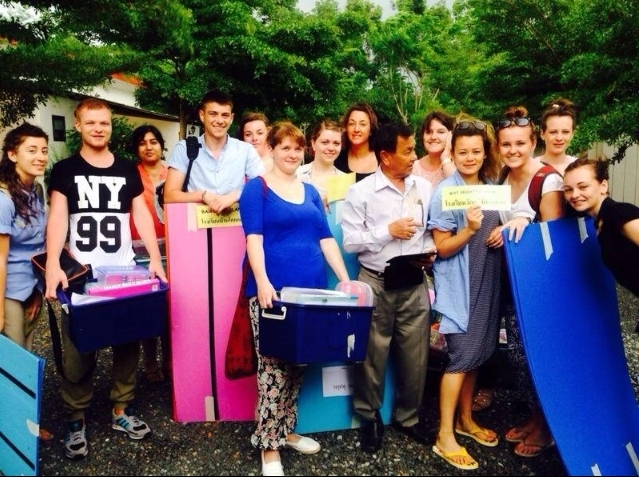 However on a Sunday afternoon, volunteers would pack up and collect our teaching boxes that we had prepared and planned and then set off on our journey via Tuk-Tuk to a very different town called Khok Kloy. We were surprised upon arrival to learn that we had a private accommodation block for all the volunteers. We had running water and flushable toilets. However once we visited the local town about half a mile away, we soon realised that despite having ants in the bed and a sewage smell from the drainage system, these apartments were a luxury in comparison to the lives of the local people. Their houses were made mainly of wood and were on wooden stilts which I was quite shocked to see, especially since I live in England where every house is built with bricks. It had occurred to me that if there was a really bad storm their house could fall apart, or if there was a fire their houses would disintegrate completely! They would also travel around by moped but with no protective clothing or helmet on, which is completely different to in England where it would be an offence. Living locally during the school week was definitely a challenge. The food available in the evening was limited. There were food market stalls set up by the locals but unfortunately I did not want to risk my health due to poor sanitation; they would exchange money with customers and then touch the food without using hand wash or gloves, also the food was cooked open-air and there were always flies hovering on the food. Luckily there was a randomly placed Tesco shop which I was shocked to see. I bought crackers apples and bananas as my evening meal as I had no access to cooking facilities at the apartment. At school I was welcomed and as a thank-you from them they would provide my lunch every day. As I am a vegetarian, I mainly got given boiled rice with a sauce or noodles which was fine. I would fill up on rice knowing I would not have a substantial tea. At school we moved from classroom to classroom and the children willingly carried the heavy teaching box to the next classroom and I learned that this was part of their culture to show respect to their teacher. They would also be expected to sweep up leaves outside during some of their break times and also children would take off their shoes before entering the classroom. At the start of each day there would be a whole school service in which the Thai flag is raised and they sing the national anthem. I felt this was a really important part of their culture and again is to show respect. One of the first few days in school was ‘Anti-Malaria Day’ where the staff gave out a powder sachet to all children. The Head Teacher spoke very little English, but she managed to communicate to me that it was for the children to mix into their water at home to make it safe as mosquitoes lay their eggs in the water. She also stated that a man had died just two weeks prior due to malaria. This emphasised a major difference between cultures as in England we have access to clean, safe, hot and cold running water, whereas in this deprived area safe, clean water is a luxury. This was a tough realisation for me; these children and families were poor and living in disadvantaged conditions at no fault of their own, a matter of life or death and all due to a lack of money. This made me increasingly aware of how crucial my role was; they need good English teaching to have a chance of a good job and earn a good salary to avoid living in such conditions. As I walked to my next classroom, I was shocked to see that children were being taught by a Television (TV) and then were copying information and writing this into their books, with no teacher around due to not being able to afford extra staff. But as a trainee teacher myself, I have a strong passion and a well informed view of a good education. Being taught essentially by a TV is not supportive to the children’s development, if they are unsure about something they had no-one to help them or similarly they had no-one there to implement the scaffolding theory to develop learning further thus meaning development of each individual child’s potential could be hindered. 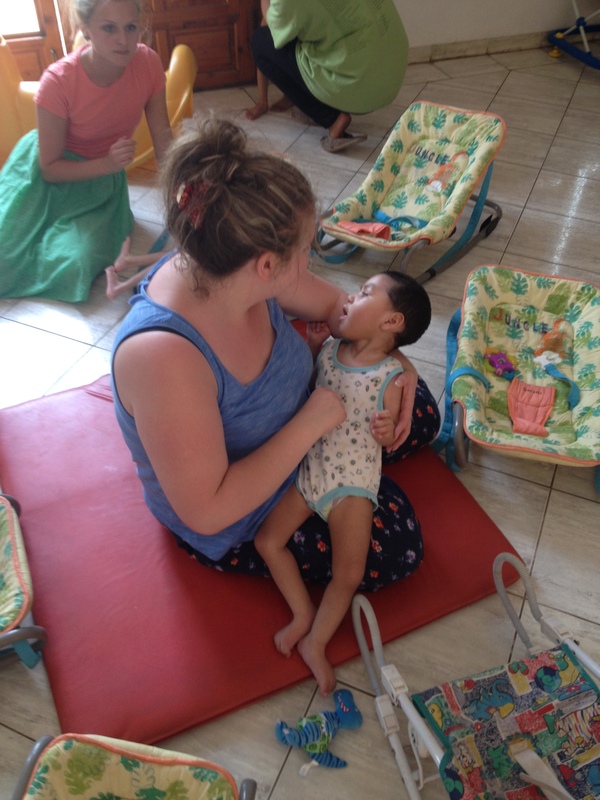 I have learnt more than I had hoped to learn during my time in Thailand. Learning about a different culture as a local has been a very insightful experience; to witness a very poor part of the country has really emphasised to me that it is not just a lack of money that means they are poor, but a lack of sanitation, clean, safe water, food and opportunity. The term ‘poor’ to these people can literally mean the difference between life and death! I am very fortunate to have the lifestyle I have and the opportunities I have had access to. Living in a country where education is free and luckily learning English as the main language that is the most dominant around the world has made a huge impact on my opportunities. I understand that money is not everything, but my time in Thailand has reinforced what a powerful resource it is! What I Enjoyed and Challenges Faced? I really enjoyed experiencing a new culture and living away from home for nearly 5 weeks was a great experience. One of the biggest challenges was the language barrier in school. After attempting to teach about family to the Year 1 pupils, it became apparent to me that the picture and word cards may not actually be very helpful to their learning. This was due to the fact the picture for ‘Mother’ was a female, however this did not necessarily mean the children would interpret the meaning of ‘Mother’, as it was not a picture of their family members so I did not feel it created much meaning to the children. I decided to use the Google Translate app on my phone to convert the English vocabulary into Thai vocabulary so that the children would hopefully be able to link the English words and create meaning. Whilst researching this information during the lunch hour, children would often crowd around and as I would listen to Google translate and practise saying the words the children would cheer if I pronounced it correctly which was nice . This interaction was really enjoyable as it allowed me to try and communicate with the children in their language, helping to break down the barrier. Another challenge was that the office where volunteers plan and have access to computers is based at Khao Lak, so I did not have access to any resources during the week it was simply only what was in our teaching packs. So if a child was struggling or had completed work earlier than anticipated I was unable to alter the planning dramatically due to having no access to resources. This meant I had to think on my feet a lot of the time and create games to play using what was available in the classroom. The money donated from the Eleanor Peel Trust Fund helped me towards an overall cost which included flights, accommodation and food etc… The experience is one that I will never forget especially as it is something I feel passionately about – Teaching! 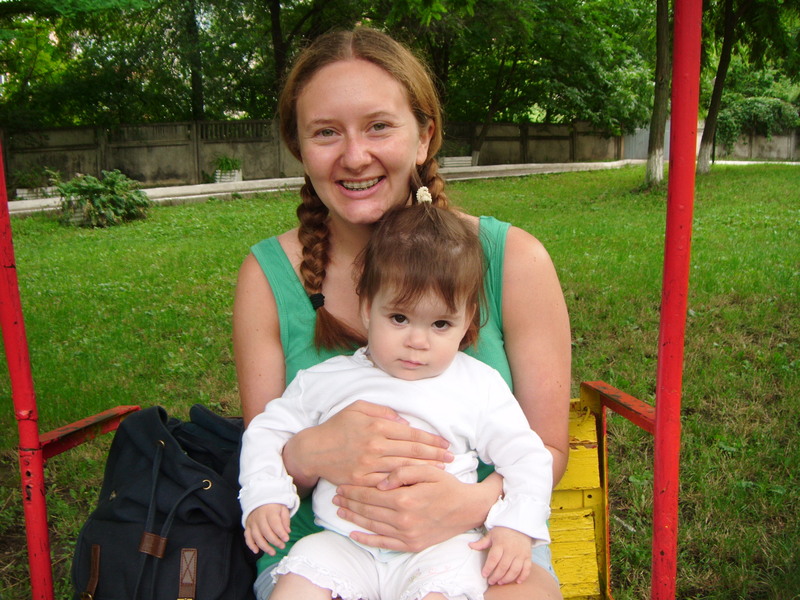 I am very grateful for the contribution as it has helped me to experience a very different placement in a diverse culture whilst giving me opportunity to Teach English as a Foreign Language (TEFL). I hope to have made a difference and wish for their future to be full of opportunity. A wealth of knowledge provided by a good education system is one of the most powerful gifts to a child, allowing them access to opportunities. This experience has definitely made me even more passionate about my future career as I aim to become an outstanding teacher. Thank-You to the Eleanor Peel Trust Fund! The main reason we went was to teach English (with the choice of any other subject) in orphanages. There were 3 orphanages we were situated at, the first was the boy’s private orphanage, the second was a girls private orphanage, the third was a mixed government orphanage. These were relatively close to our accommodation, up to a 45 minute tuk-tuk ride away. George is currently on the Physical Education (BA Hons) degree, therefore was eager to teach P.E. or sports. Claudia has recently completed the Primary Education with QTS (BA Hons), therefore was equally enthusiastic to implement creative lessons, such as arts and crafts. Roughly 40,000 in Sri Lanka died. Another 800,000 people living on the coasts of Sri Lanka have been directly affected. It traveled 375 miles (600 km) in 75 min. That’s 300mph, leaving more than 1.7 million homeless affecting 18 countries. We were able to implement both a creative arts lesson and a sport development programme in the orphanages, thanks to the aid of 2 charities, Carlisle Overseas Aid Trust (COAT) and the Carlisle Rotary Club. Both of whom gave us the resources to buy sports equipment and creative arts equipment and resources for teaching. We were able to teach sports that some children had never played before. 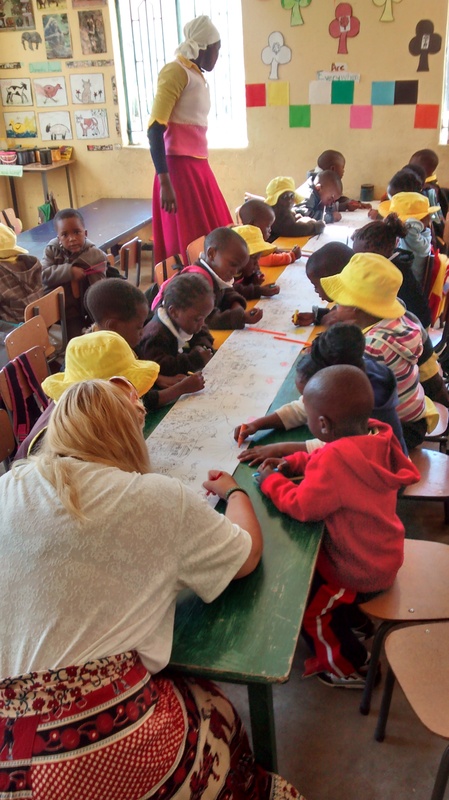 The children were able to paint and draw and other activities, which the orphans were extraordinarily elated, enthusiastic and grateful about the teaching, materials and equipment we were able to provide. Sri Lanka is obviously a very different culture with a whole different set of beliefs, we found it very easy adapt to as the values and philosophies are broadly similar to that of our own. Most Sri Lankans are Buddhists, we learned the ways and teachings of Buddhism, my view is that they are very peaceful and respectful people, based on the fact that no-one I met there was impolite, offensive or unpleasant. Another culture change was the accommodation, which was very basic, however the major adjustment was the dietary change. The Sri Lankans have a lot of curry and love spices, this was different however I welcomed the food, and really enjoyed it; recognition should go to both of our host families and representatives of PMGY, for their generosity and hospitality. The Eleanor Peel Trust gave us our first capital of fundraising, the funds were used wisely and put towards the cost of the programme. This inspired us to fundraise ourselves to raise the remainder of the cost and supplementary for resources. Not only are we grateful of the funds gained from the Eleanor Peel Trust, but also all of the Sri Lankan orphans that benefitted from our experience are incredibly appreciative. As we stepped off the rickety thirty-man plane onto Moldovan soil at 10:30PM, it was already apparent the difference in culture. People before us in the line for passport security were given a once over, whereas our passports, clearly British, were given a bit more scrutiny. The comparison of airports was one of the biggest shocks, especially the sizes; we’d started at Terminal 1 in Manchester Airport at 6:20AM to Germany’s Frankfurt to then be re-routed, due to bad weather, to Romania’s Bucharest and, finally, Chisinau (Quiche-en-ow). I needed three different types of vaccinations: Typhoid, Rabies (three separate injections) and Hepatitis A & B (a combined injection which is, also, three separate injections). Typhoid and Hepatitis A & B are covered by the NHS (unless you’ve already had A or B then to have a booster or an individual injection of either A or B then you are charged), but the Rabies vaccinations were not. The Eleanor Peel funding helped towards this as our doctor highly recommended this vaccination, but I would have struggled without the help. Our coordinators, Victoria and Valero, were fantastic. They couldn’t have been more accommodating and were at our rescue in a moment’s notice; especially when we got lost a couple times! Each day, apart from the weekends when we were given the opportunity to explore the capital city, we entertained the children from 10:00AM until noon and from 4:00PM until 6:00PM. These are the cooler parts of the day when it’s safer and much more fun for the children to be outside. I was put with a group of eleven children ranging from the ages of two through to seven all with different disabilities. Each child was a delight to be with! Due to there being, on average, two nurses per eleven children, when they’re outside the children don’t get a lot of time playing or moving about. They have trampolines, swings and playhouses, but they don’t get to use them if there aren’t enough volunteers. They loved being able to interact with different children to their usual group and loved it even more when we brought lots of different toys each day for them to play with. We learnt about fifty common phrases and words in Romanian; both children and nurses seemed to appreciate the effort we made with the language. I’d only ever been out of the country with family, so this trip has opened my eyes to the responsibility there is to travelling, as well as the difference in culture, society and development of other countries. Working with the children has made me appreciate so much in my life. Even with the language barrier these children taught me to enjoy the little things in life and to not take anything for granted. I am writing to give my thanks to the Eleanor Peel Trust Fund that helped to fund my experience in Morocco. I also wanted to raise some money for the baby orphanage and to take over sports equipment for the boys and girls centres, I was very pleased to have raised £100 before I went by just collecting donations to be able to buy a large amount of baby care products and sporting equipment. 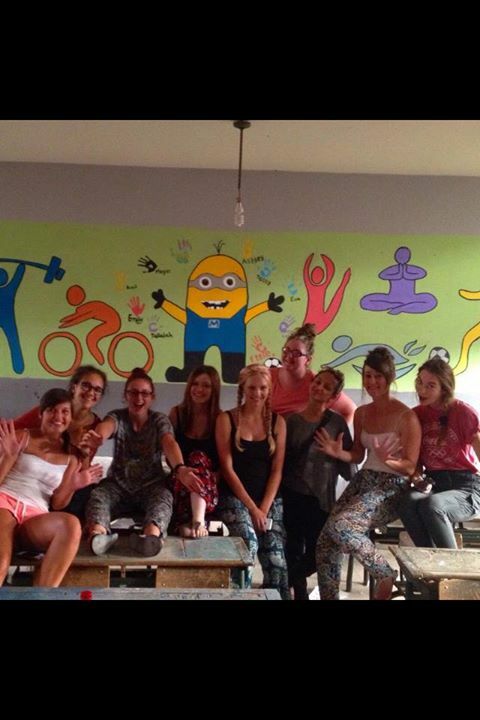 This summer I have had a fantastic experience volunteering in Morocco. I have never volunteered abroad before so after reading the Original Volunteers site I decided Morocco would be a great destination to begin. Although there were many projects that I participated in the following paragraphs summarise the projects that I think the children and myself benefitted from the most. The painting project at the local primary school, we had to come up with an idea of what to paint on one of the classroom walls. The 9 of us came up with an idea of sport and so we then thought of all the different sports we could represent. The co-ordinator drew the figures into the walls and we painted the figures and the background. We had to use cooperation, team work skills to distribute the equipment and decide on the process of how to carry out the project. The end result of this project was fantastic, it really brightened up the classroom and we all felt such a sense of achievement for what we had done to this classroom, making it a much more pleasant environment for the children to learn in. At the boys and girls centre’s where we carried out play work with the children. This was often more difficult with the younger children as in Morocco children are taught Arabic first and French second, English is then taught last, so where some of us could speak some basic French this was no use with younger children as they didn’t understand what we were saying and sometimes this became frustrating for them as we couldn’t understand what they were trying to say, but we managed to overcome some of the barrier by drawing pictures and using actions to surpass this language barrier. This will be useful when I am working in the classroom with children that have English as an additional language as I will be able to apply some of what I learnt in Morocco to help support the children. The most rewarding but heart breaking project was the Espoir baby orphanage where we went to help play with the babies and children. The orphanage was set within a lovely hospital complex but within its own little nook, which has been painted in bright colours and is surrounded by trees and plants. In the orphanage they had 30 children babies with ages ranging from 2months – 11years, they have 3 members of staff on at one time which all seemed to have a brilliant bond with all the children. It was lovely to see all the children so happy considering their situation at the orphanage but there were poorly babies and children in there. 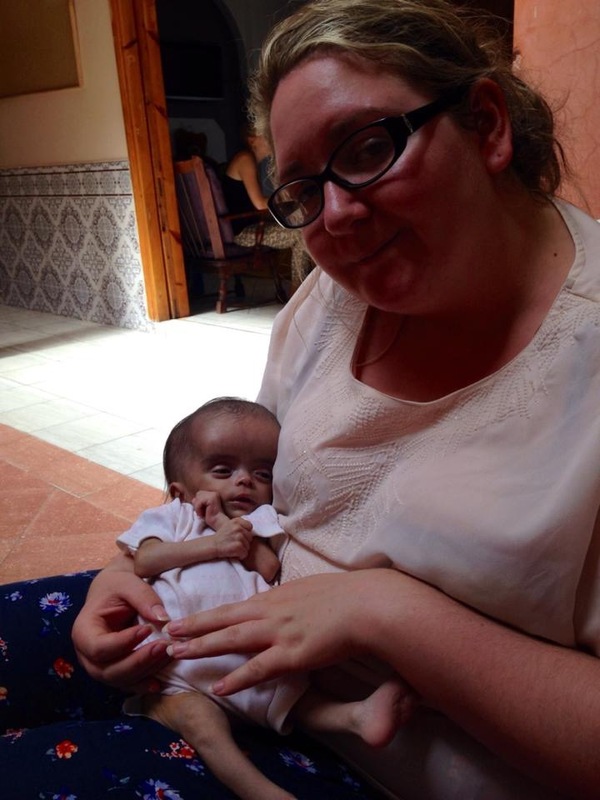 There were two older children that were physically disabled, and spent their days in a large cot, which was the most difficult to see, there was also a child aged 3 months old with water on the brain, he was the size of a 2 month old premature baby, this really upset me that this baby was not in a hospital where he should have been, however I did not let the sad part overshadow the other babies that were in the orphanage running round with great big smiles on their faces. I felt like our short time there gave the children a chance to have a bit of attention and in some cases give children physical and emotional experiences they otherwise wouldn’t have experienced and allowed the other staff a short period of respite. Everyone was so welcoming and I met some fantastic people that I am going to stay in touch with! Each week we were given a timetable of projects we could participate in, varying between 3-5 projects, therefore in our spare time we explored Marrakech and went on a variety of excursions that included the ouzard waterfalls, a traditional Berber house in the mountains; where we learnt how to make a Moroccan tagine and mint tea, the El Badi palace, the Majorelle gardens and our favourite place to go in the evenings for tea was a rooftop at the Jemaa El Fna; a square full of vibrant acts, snake charmers, food stalls and so much more. This trip has allowed me to realise how much we take for granted in the UK, from our education system to the NHS and as being treated with respect, on too many occasions the men would shout degrading things at us as a group of girls, which angered us as we were there to volunteer and help the disadvantaged however we realise that they do not see the whole picture of us as we walk past. I would definitely volunteer abroad again (hopefully next summer). Volunteering has allowed me to appreciate a whole new culture and experience things I would not have if I didn’t go to Marrakech. Thank you again Eleanor Peel Trust. In the aftermath of the 2004 tsunami, the local community of Thailand requested that people should be taught English whilst they were trying to re-build their lives. 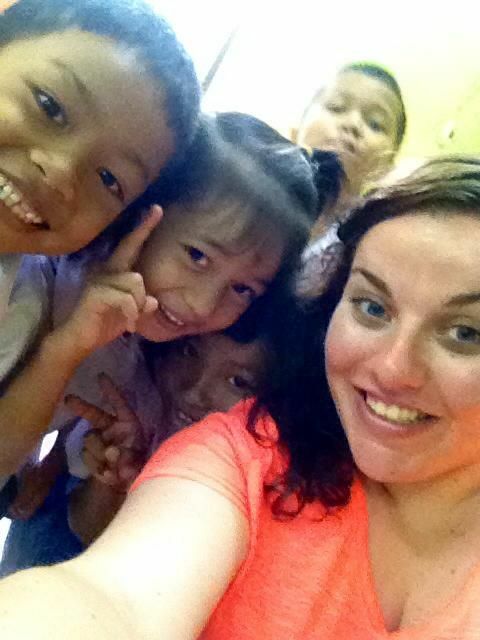 Over a period of time, I had the pleasure of being involved in a project working alongside Original Volunteers through going into a local primary school in rural Thailand and teaching a wide variety of children some who had never seen English speakers or had never spoken English themselves. 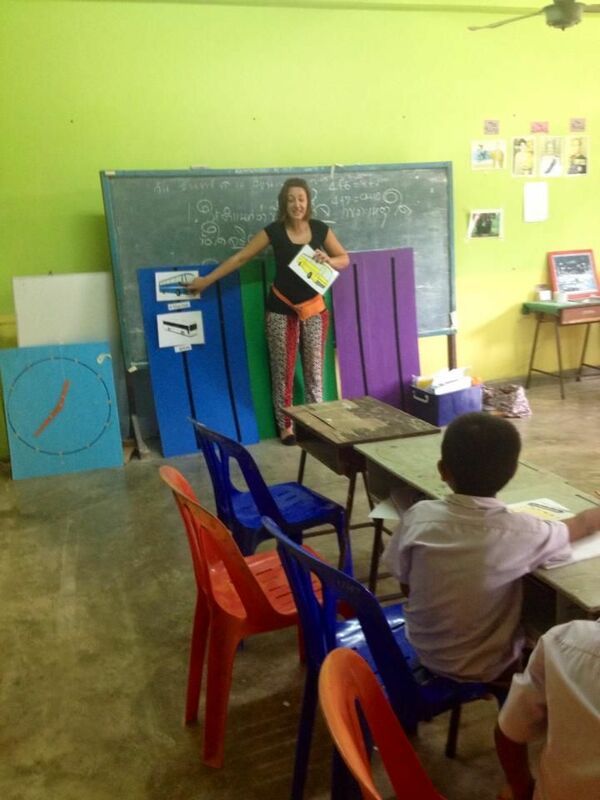 Even though the time teaching in Thailand was short, I will never forget the once in a life time experience working with under privileged children, proving them with adequate English lessons which offered them the fundamental English skills they wished for. For four days a week, myself and another volunteer would travel to Sam Chong via a small boat ride. The small rural school in a deprived area of Thailand, where children lived in run down shacks and would walk about bare footed emphasised and highlighted how important it was for volunteers including myself to travel out to Thailand and provide them with English skills they so desperately need to succeed in life. The experience itself was extremely eye opening in terms of their way of life and how different schooling over in Thailand is compared to it at home in England. Their school day appeared to be very relaxed, with children walking in and out of the school grounds throughout the day; you would search all day looking for another teacher to talk to without any luck and would often find a class of children sat in front of a television learning to draw. 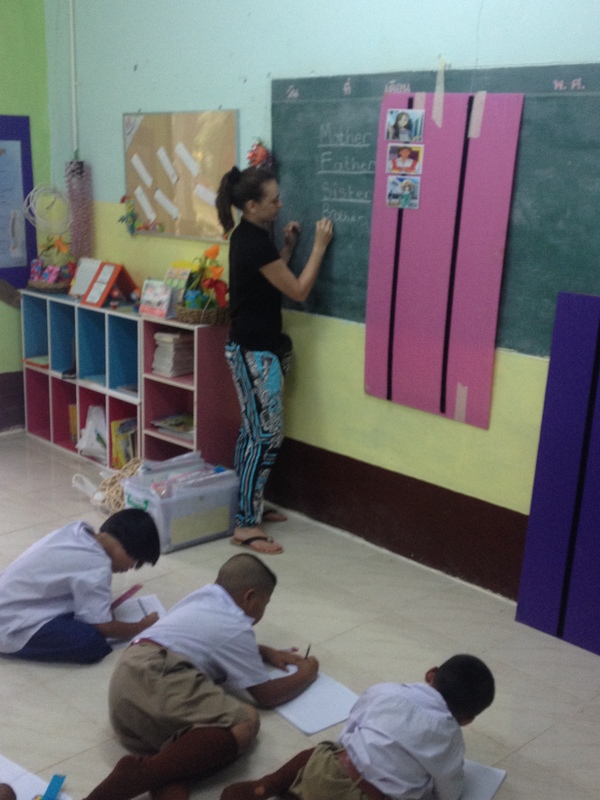 Spending our days teaching a whole variety of Thai students was extremely fulfilling. Children as young as five, who knew very little English, would sit in front of you and have no idea what you were trying to teach them, so at times this was quite challenging in terms of trying to teach, motivate and control their behaviour. 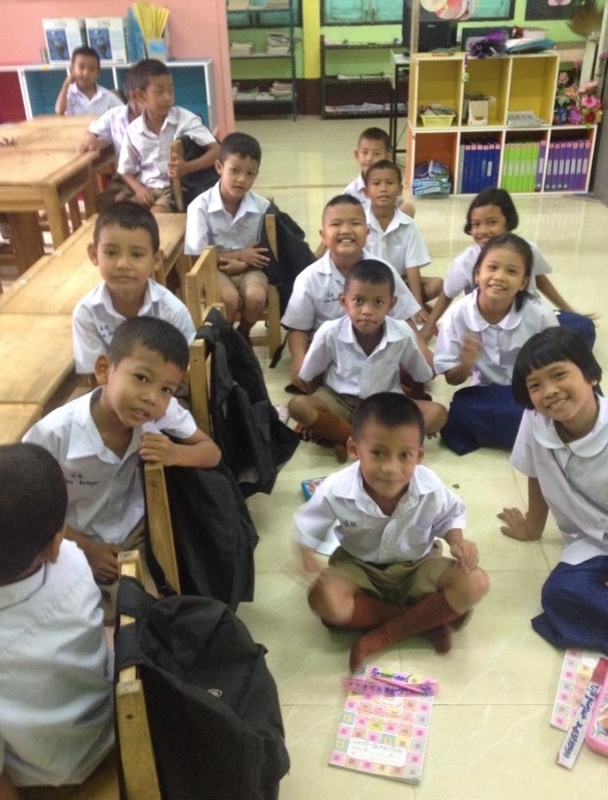 They would run around the classroom, talk and laugh between one another and for someone who did not know any Thai it was quite difficult to understand what they were trying to communicate and how to control them. On the other hand there were classes who were an absolute pleasure to teach, who you knew loved to learn and had the determination to learn as much English as possible. The older children would love to play bingo, so with every topic we chose to teach them we had to adapt it in order to play bingo. Their enthusiasm to the topics made the whole experience worthwhile and stressed how important it was for volunteers to continue to travel out to places such as Thailand to help people who desperately needed English if they were to lead a successful life. The experience as a whole, allowed me to gain experience with children whose first language was not English and how I can adapt my teaching in order to benefit them. When leaving the island on our last day of teaching the reaction of the children highlighted how much they valued our presence, they wished for us to return the following week and were surprised and appreciated the resources we had left for them in the form of notebooks, story books and stationary and would continue to thank us until we left the island. It was difficult to leave the island of Sam Chong on our last day of teaching as you realised that although it is fantastic that they have had access to native English speakers, that the majority of those children would probably never leave that island and go onto to be successful. Although you were able to see the potential that these children could have, the resources and opportunities available for these children were extremely limited. 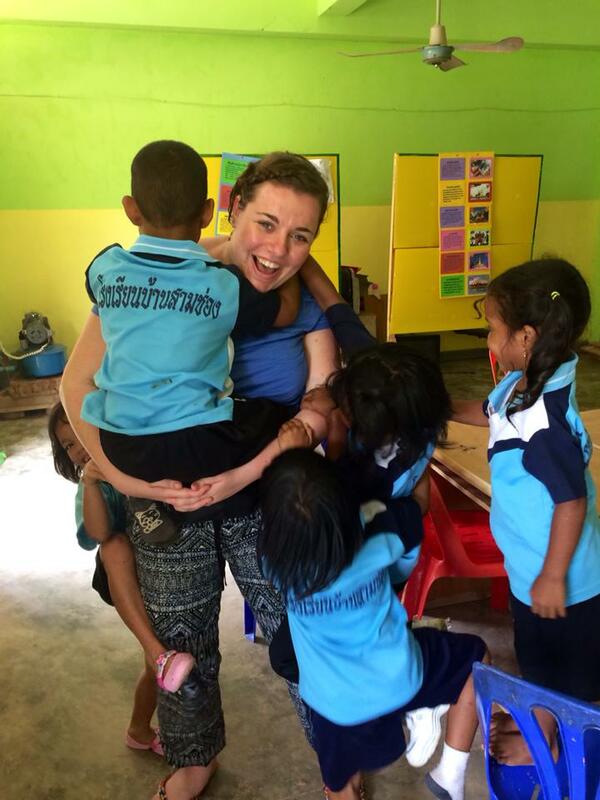 If my time volunteering in Thailand benefited one child in the near future I would be extremely happy and would show that my time out their made a difference to children who may never get the opportunity to learn English again. 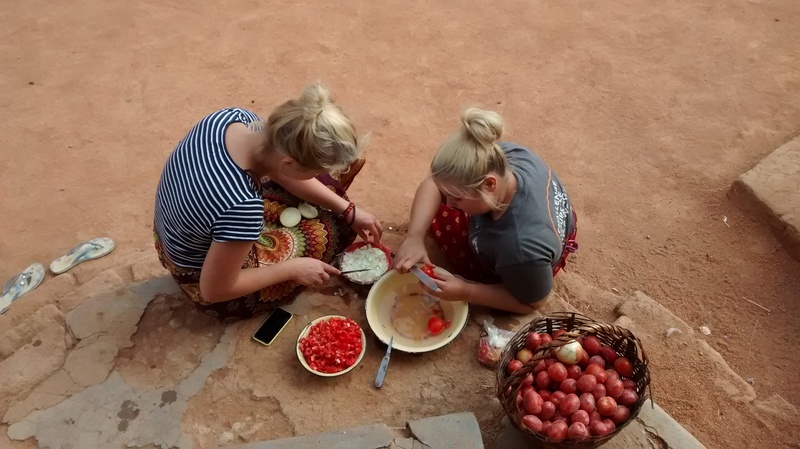 I hope people consider volunteering abroad whether it is teaching or helping within a community because the experience allows you to witness things and cultures that you may never get the opportunity to experience again. I for one would definitely consider volunteering abroad again as I saw how these countries rely on the help of volunteers to provide skills which they themselves will never be able to provide.